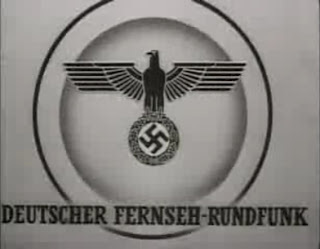 Before American TV, British TV, French TV or any other regular television service, there was Deutscher Fernseh-Rundfunk -- the state TV service in Nazi Germany. Nazi TV went on the air from Berlin in 1935, beating the BBC's regular television service by a year. And, amazingly, hundreds of 35-millimeter movie reels of programming survive, some of which we get to see in the above Spiegel TV documentary from 1999. BUT WHAT'S INTERESTING is how the Nazi leadership had serious doubts about television's effectiveness as a propaganda tool. Obviously, they couldn't foresee the day when Hollywood got a hold of the idiot box and changed the world. Which brings me to my point. Television is a lousy propaganda tool if you're all about convincing the crowd instead of that one person glued to the tube. If you're all about overt propaganda, TV is about as effective as screaming on a street corner. No, TV -- and radio, in a different way -- is all about showing. It's about entertaining, and it's about distracting. Ultimately, though, it's about relationships. On television and radio, the most effective messages are subliminal, not direct. You build a relationship, you humanize your subject . . . then you slip in your message. Don't preach, show. Apparently, the Third Reich's leadership, in this case, couldn't think inside the Box. Watching the old Nazi TV clips, it reminded me of an evil version of EWTN. Der Führer couldn't see television's possibilities for spreading his lies. And today, the Catholics (for one) can't figure out how to use it -- or radio, for that matter -- to tell the truth. Both are often painful to watch.